Let’s face it. Planning and budgeting is not marketing’s favorite activity. The process is like trying to herd cats. There's no defined process, so you attend mind-numbing meetings and review endless and meaningless spreadsheets and PowerPoints. Through it all, you have no idea what this has to do with your job and once the process is done and the plan disappears never to be seen again, you don’t care. Welcome to planning season. Fortunately, there is a better way - Have marketing operations (MO) lead the process. When this happens, the benefits to the CMO, marketing and sales are impressive. It’s fascinating to see the marketing operations organization assume more and more responsibility. In today’s more sophisticated marketing departments, one of those areas is strategic planning and budgeting, but with a significant twist. The twist is rather than treating planning and budgeting as a singular annual event, it's treated as an ongoing process throughout the year. The SPB&M model provides an overview of this new process. 3. Broker shared KPIs and publish plan. 5. Responsive adjustment and optimization. This is where the MO leader shines. After all, the MO team owns all the performance data! While not a linear step in the model, a key element is Lead and Manage Change. This is such a critical driver of success, we have chosen to call it out separately and have it appear in every step of the model. It's represented by the horizontal bar across the bottom of the model. The words most used by CMOs in describing how they benefit from an MO-led planning and budgeting process include credibility, confidence, visibility and alignment. 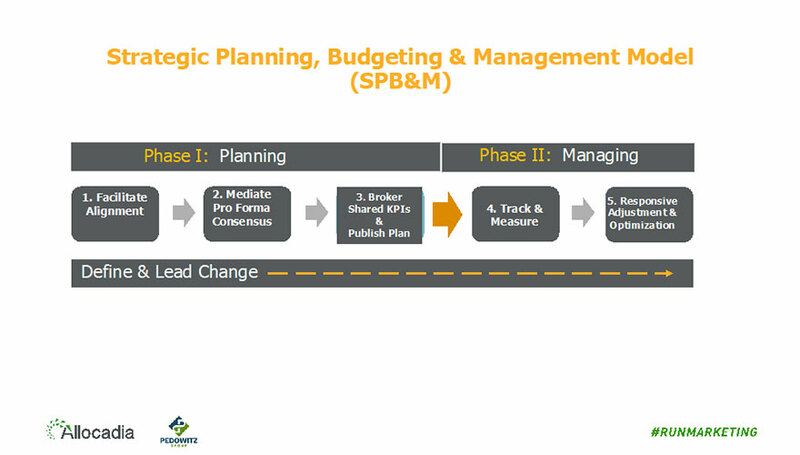 The SPB&M process contributes to securing the CMO as an important member of the strategic conversation around annual planning. It helps the CMO to build a 'win together, lose together' culture because it aligns marketing goals to company and sales goals. The process also drives visibility, transparency and accountability to complementary KPIs.